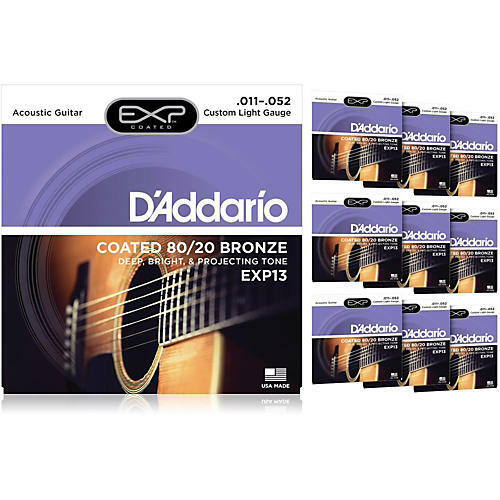 The 80/20 bronze wrap wire on D'Addario EXP13 Custom Light acoustic guitar strings has a micro-fine coating applied to it before it is wound onto the hex-shaped core wire. The result is a built-in barrier against the corrosion and wear that can quickly sap the life out of your strings and your guitar's sound. D'Addario EXP strings have a natural round wound feel and extra-bright tone that lasts 3 to 4 times longer than traditional guitar strings. Coupled with D'Addario's compound-plated plain steel strings, EXPs are some of the longest lasting, most natural sounding coated strings you can buy. Pack of 10 string sets.